Michèle Swiderski celebrates the upcoming launch of her book, “A Joyful Life: How to Use Your Creative Spirit to Manage Depression”. The Peterborough author used her personal, spiritual tale of managing depression to help others facing similar challenges. 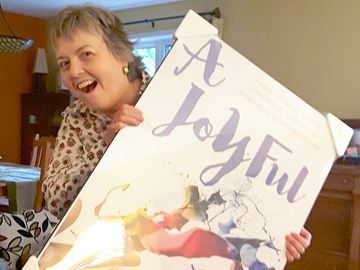 PETERBOROUGH — After years of battling depression, a Peterborough woman hopes to help others heal by offering insights into her personal journey back to understanding joy. Michèle Swiderski has lived in the Peterborough area since 1995. Seven years later, she faced her first episode of depression and spent years afterwards trying to cope. When her most recent episode hit in 2010, Swiderski decided she needed to try something new. “I didn’t want to follow the same old route,” she says. Now, she’s eagerly anticipating the Feb. 21 release of her book entitled A Joyful Life: How to Use Your Creative Spirit to Manage Depression. As a spiritual person, Swiderski says when she faced her 2010 episode, she asked for assistance from the Holy Spirit. Not only did the Holy Spirit her find the most meaningful books for her personal journey, He also showed her the importance of creativity. She took a year off from her job at the Ministry of Natural Resources and Forestry and focused on her health. Upon her return to work, Swiderski gave a presentation to her colleagues about the battle she was facing. It was a full house, she says, and unfortunately she didn’t have enough time to answer all the questions from audience members. A few days later the solution came to her; in a book, she could share her experiences with a wide audience, hopefully helping others in their battles against depression. “I felt like I had the best kept secret,” Swiderski says. Most of the content was already there, she says, noting the journals she kept and the presentation to her co-workers offered insight into what she was feeling and how she managed her depression. Over the course of two years, she compiled her personal accounts before engaging with a content editor in May of this year. That process continued until September when her book was sent for the final editing stage. Now, Swiderski is eagerly awaiting its official release. Publishing the book was therapeutic in itself, says Swiderski, although that was never the intention. “It was incredibly liberating,” she says, adding she feels lighter knowing she has shared the information with everyone who wants to hear it. “It wasn’t contained inside my body anymore. I opened the door, gave it wings and it left on its own accord,” says Swiderski. Although she says there are numerous books about depression, the Peterborough author says her book is different because of the focus on finding a creative outlet. As someone who works with fibres, Swiderski says she pushed herself to put her creative juices to work as much as possible through her year of healing. Although there were days when she didn’t want to even step out of bed, a half hour of being creative — of making something — could always be counted on to make her feel lighter. This wasn’t a fluke or a one-time solution, says Swiderski, the evidence is found in the journals she kept as she documented her journey. Each day she would write about how she was feeling, what activity she was going to try and how she felt afterwards. Each day, the results indicated the creative outlet made a significant impact. “It was all documented. I always felt better…My brain was more alive,” she says. Her book shares those results and, according to Swiderski, offers people something they may be struggling to find. “It gives people hope and perhaps it will provide some examples, some ideas about what they might be able to integrate into their own journey,” she says. On Feb. 21, Swiderski says she’ll be holding an official book launch at Hunter Street Books from 4:30 until 6:30 p.m., with time for questions and discussion. That interaction, the conversation between people who may face similar challenges unique to each individual, is what the book is all about. “When you have depression, you think you’re all alone…This book is really to open up that conversation,” says Swiderski. Excellent Michele. Proud and happy for you. Big bear hug. Jamie, you captured my message beautifully. Excellent work!